Thanksgiving is just 15 days away. It’s traditionally the start of the winter holidays and where many of us spend hours on end cooking for family and friends. I love this time of year but many dread it and worry about how their meals are going to turn out and if they’ll have enough food for everyone. Are you always stumped when it comes to how much turkey to order for Thanksgiving? Well, a good rule of thumb is one pound per person. However, if your family is like mine we like to have plenty of leftovers. If you want leftovers as well, figure 1 1/2 pounds of turkey per person. That way you’ll have enough to cover you through the weekend, depending on how you eat and even some to share with your guests if you like. If you’ve never made a turkey before and are already stressing about the big day – DON’T!!! Making a turkey is the easiest thing in the world to prepare. You basically pop it in the oven and take it out hours later when the inner part of the thigh reaches 180(F)degrees, the breast reaches 165(F)degrees and the juices run clear when pierced. I always stuff my turkey but many prefer to keep the stuffing on the side, which is perfectly fine. 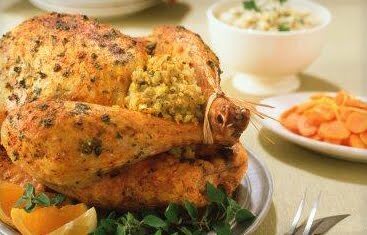 If you also stuff your turkey, make sure to put the stuffing in just before you place the turkey in the oven to avoid any bacteria to grow. You can even heat the stuffing up a bit which some say helps avoid bacteria growth. I’ve never had a problem stuffing mine though and I’ve been stuffing my turkey for years. Just be sure your oven has had plenty of time to preheat before setting the bird in the oven. In addition, if you want to insure you have a moist turkey when it’s done, add at least an inch of chicken broth or water in the bottom of the pan. If you don’t have a rack to place your turkey on, then cut up some carrots, celery and potatoes and place them in the bottom of your roasting pan. Then place the turkey on top. The vegetables will act as a rack and while the turkey is cooking it will flavor the veggies and cook them making for a nice platter of turkey and vegetables. In addition, the potatoes will help to thicken the gravy from the liquid that you originally added to the pan. Serve as is, or doctor the drippings for an even more flavorful gravy. Don’t forget to check out my perfect gravy everytime tip! If you have any turkey questions feel free to email me at vkb2@hotmail.com, post a question on this blog, or go to the Butterball homepage where they offer a host of answers and videos for any question you may have regarding your turkey. Butterball has a great site and even a 1-800 hotline for you to call on Thanksgiving Day. Whether you’re roasting, grilling, frying or smoking your turkey, Butterball.com has the answers 24/7. Stay tuned for my upcoming video on how to make Popovers. One of the dishes my family insists I make every Thanksgiving. These light and airy popovers are a cinch to make, beautiful to look at and delicious to eat. My video will be up sometime within the week. Until then feel free to email me with any of your Thanksgiving Day questions. Those are really good tips – I always wonder if I am getting a large enough turkey to have plenty of leftovers. Do you think you should brine the turkey and what dishes can you make earlier or what ones shouldn’t be done earlier? It’s always difficult to know how much more turkey to get that’s why I thought I’d post this. In fact this year I doubled my turkey since I know my son will want to take some back to his place. He and my husband love the turkey leftovers so I had to make sure my son had more than his share to take home with him. The guidelines I posted are a great rule of thumb. I would normally just go 1 1/2 pounds per person but this year I’m doing the 2 pounds. Of course we are a smaller group so doubling brings my turkey only to 18-20 pounds. Try going 1 1/2 pounds and then if you wish you had more, you’ll know what to do for next year. I think that brining tastes great if you make sure you rinse your turkey several times after you’re done brining. Otherwise, the turkey will be way too salty. I don’t brine my turkey for two reasons. One my turkey is always quite moist and second because I have relatives who have to watch their sodium intake. Regardless of what they say it’s impossible to remove all the sodium when brining. I don’t want to risk causing anyones blood pressure to go through the roof or get sick, so I avoid brining. That said though, I think if you like the taste of a brined turkey, then by all means brine. Remember to cool your brine completely before placing your turkey in it. I would suggest cooking the brine 2 nights before you plan to roast the turkey. Let it cool overnight in the refrigerator. Then place the turkey in the brine for up to 24 hours, and on Thursday, rinse, rinse, rinse inside and out. Place your turkey in the oven to cook and you’re done. I hope that helps. As for the other dishes what did you plan to cook? Everyone always does something different. Thanks for your posts Lanie and Elaine. I have never brined a turkey and was just reading about it and some feel like it is the only way and others say don’t bother. I really don’t want to add sodium, mainly looking for ways of flavoring and keeping moist. I will try adding broth as you mentioned in the pan. I also plan on putting the stuffing inside this year. I usually do a cranberry dish, green bean, sweet and mashed potato w/ gravy and pie besides the turkey – the bread my Mom brings and I do a salad that day. Thanks for your input! 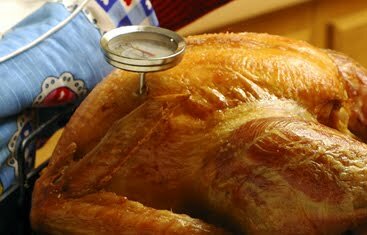 I add broth to my roasting pan and have a lid that covers my turkey with a small vent to let the steam escape. Near the end of the cooking time I uncover the turkey to let it get even more golden brown. My turkey is always so moist and delicious. Plus I stuff mine. Having a great meat thermometer is helpful. They even have ones that you insert in the beginning that will let you know when your turkey has reached to desired temperature. I recommend those if your turkeys have a habit of coming out dry. If not, then an instant read thermometer is great. As for the sides, your cranberry sauce could certainly be made on Monday and then covered in the refrigerator to chill and let the flavors meld. I make a sweet potato casserole typically on Tuesday or Wednesday and then cover it and place in the refrigerator until Thursday. Then I take it out in plenty of time to get to room temperature and then place in the oven in the right amount of time so that it’s ready when the meal is. However, if your potato recipe isn’t one that goes in the oven then you can make it earlier in the day and then place them in a heat proof glass bowl, 30-45 minutes before serving, over a pot of hot steaming water covered with foil. Stirring frequently this will reheat your potatoes and they will be moist, hot and ready to serve when you are. I’m not sure what your green bean dish is but I would prep what you can ahead of time and then be ready to place on the stove or in the oven just before serving. If the gravy can be done in advance without the use of liquids from your turkey then do that as well and reheat in time to pour on your turkey and mashed potatoes. If a roux needs to be made I would do that just before. I hope that’s helped you. I do as much prep ahead of time as I can, that way I can actually enjoy the day with family.